NATIONAL HARBOR, Md. — SpaceX President and Chief Operating Officer Gwynne Shotwell speaks to audiences around the world and gets lots of questions. The room packed with Air Force service members and military contractors burst into applause. They seemed impressed that SpaceX is one of the world’s coolest companies and also a staunch patriot. Before the Q&A session, Shotwell delivered a 20-minute presentation that mostly featured promotional videos of SpaceX’s spectacular Falcon Heavy mission in February. The videos also drew cheers from the crowd. 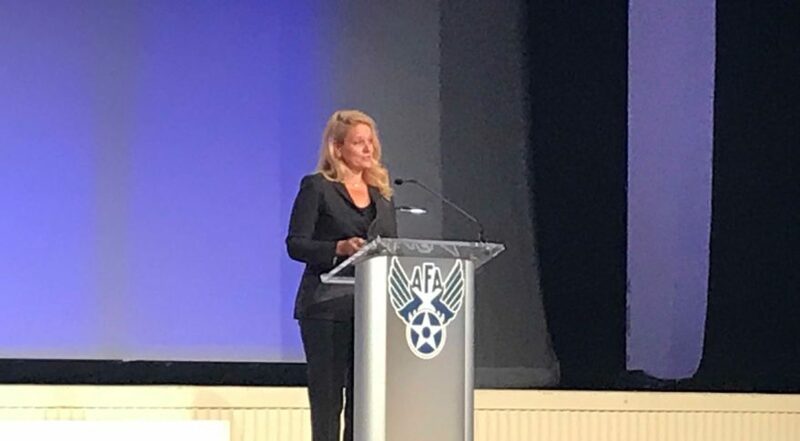 When asked how bad is the Air Force acquisition system, Shotwell said the Air Force has not cornered the market on red tape. The “most challenging” government customer for SpaceX has been NASA, she said. The company is preparing to launch its Crew Dragon capsule with astronauts onboard, a mission where failure is not an option, she said. The Air Force has asked SpaceX to make its rockets more reliable for national security satellites, but that still does not compare to the pressure of taking humans to space safely. SpaceX last year flew 18 missions, beating any other company or country besides the United States. This year, SpaceX has completed 16 missions and is on track to complete 22 to 24 launches, while China attempts to carry out 40 (as of Sept. 9, it had already completed 24, surpassing its previous national record of 22 set in 2016).